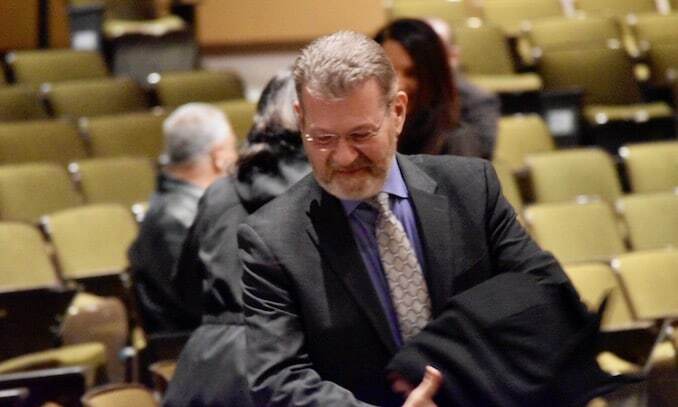 At the Town of Johnston’s Mayoral and Town Council Inauguration, held Monday night in the Johnston High School auditorium, Invenergy‘s top attorney, Chicago-based lawyer Michael Blazer, was sitting front and center. Invenergy is the company that wants to build a $1 billion fracked gas and diesel oil burning power plant amidst the pristine forests of northwest Rhode Island. Invenergy struck a deal with the Town of Johnston to purchase Providence Water and ship it via truck to Burrillville to cool the turbines of its proposed power plant. 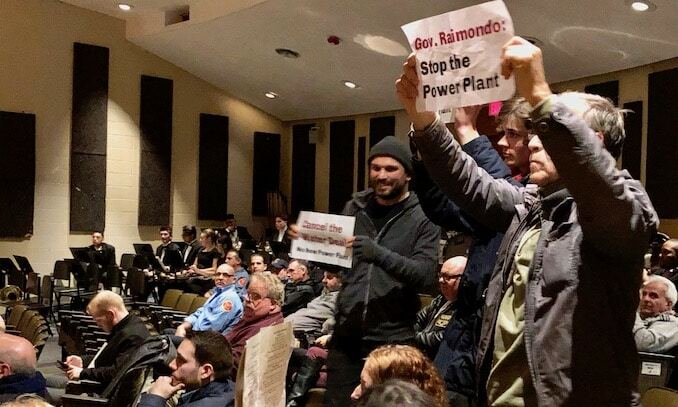 As Mayor Polisena, sworn in for his last term as Mayor of Providence addressed the crowd, six people associated with BASE and the FANG Collective, groups opposed to the power plant, quietly held aloft small signs that read, “Gov. Raimondo: Stop the Power Plant” and “Cancel the Water Deal.” Three of the people holding signs stood up. 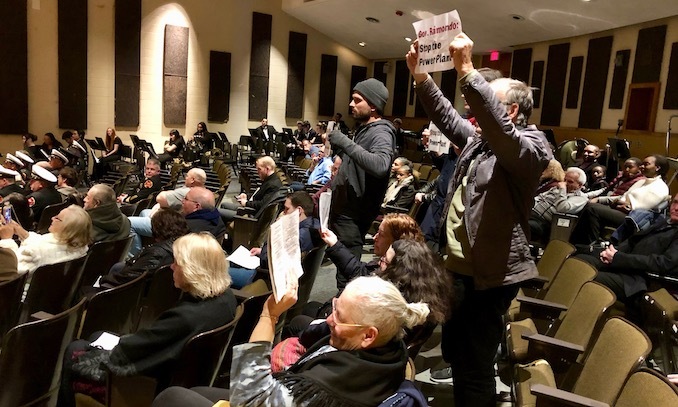 As some in the audience tried to understand what the protest was about, a large man approached the protesters and told them to “Sit down and put the signs away, or leave. Polisena noted that a new company, that will get medical waste and turn it into energy, is coming to Johnston. Polisena is talking about Sun Pacific Holding Corporation, chaired by Nicholas Campanella, who was in the audience. 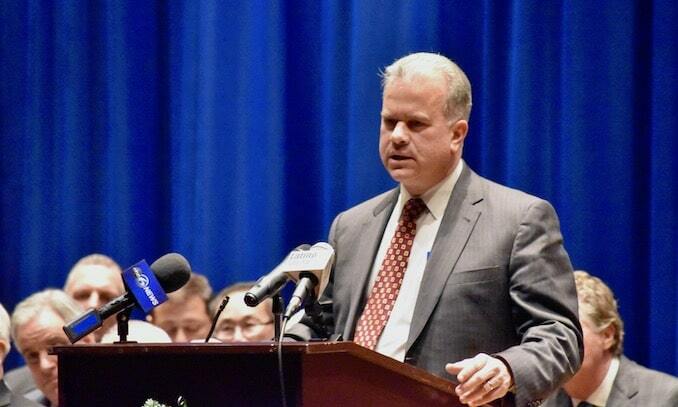 Polisena said that he’s been working with the Governor, the Speaker and the Senate President to bring a “major, major, major, major company” to Johnston. “We’ll keep our fingers crossed and keep saying our Hail Marys,” said Polisena. 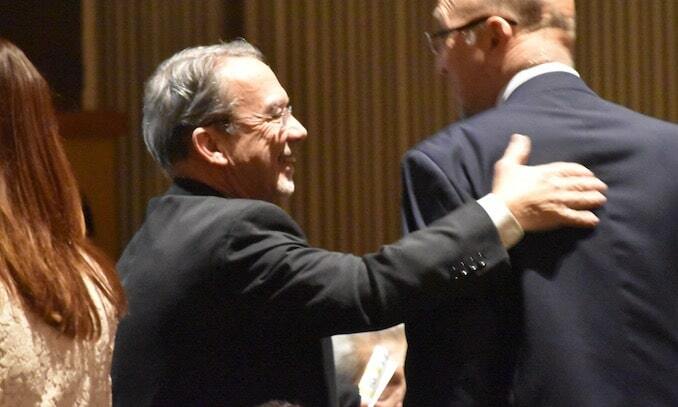 As for his plans after he leaves office due to term limits, Polisena said, “I’ve been asked about running for another office, perhaps statewide office or coming back in four years… Many have said no, but never say never. 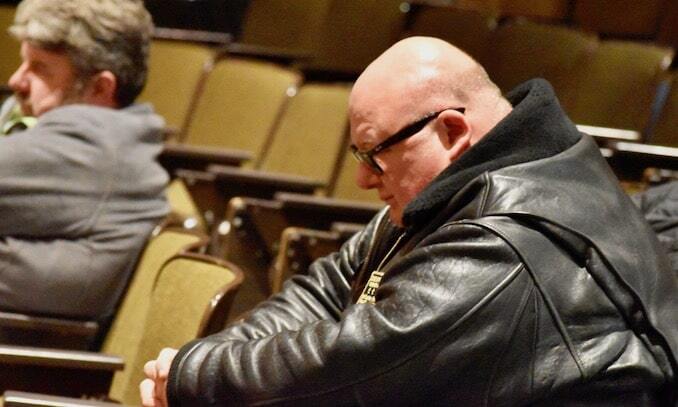 In fact, I heard Allen Roogenberg – Mr Roogenburg – is running for Lieutenant Governor. I might have to put my name in.” Polisena mispronounced former Providence State Representative and candidate for Lieutenant Governor Aaron Regunberg‘s name, either intentionally or out of ignorance.